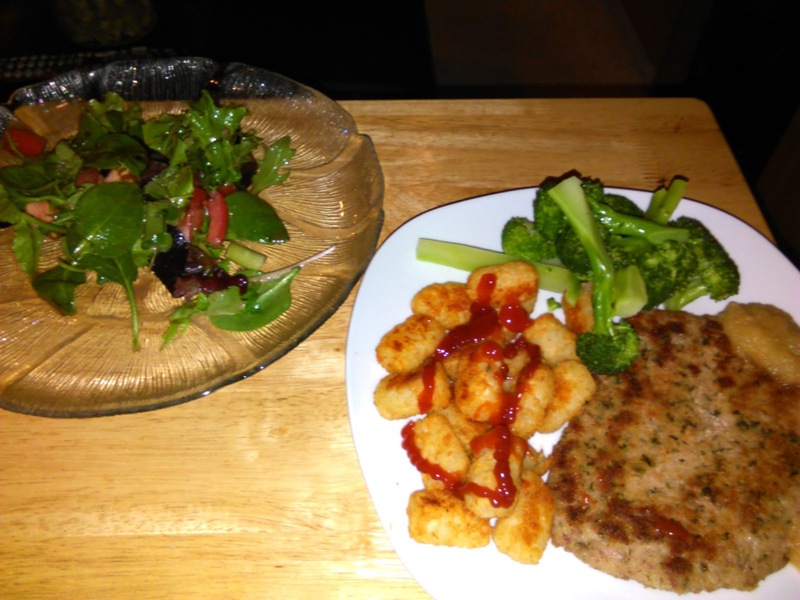 Eat Out In Every Night: Breaded Pork Cutlet with Tater Tots! I bought some Tater Tots just for a change. It's a bit of a production getting the deep fryer out so these things are an acceptable occasional change of pace. Processed foods are the most expensive way to eat too much salt and a host of chemicals on top of the most unhealthy fat, but they taste good enough. The breaded cutlet is from Mitchell's so all I had to do was fry it. I steamed the broccoli, cooled it and reheated in olive oil with a bit of salt. Apple sauce for condiment on the cutlet. tomato ketchup on the tots. It's a good hearty winter meal.